Below are some Corvette's viewers sent us. If you want yours added, please contact us. 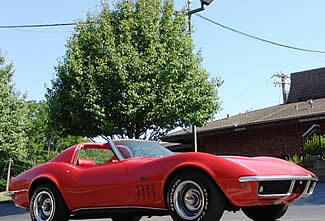 This classic corvette is finished in Monza Red with beautiful Red interior. 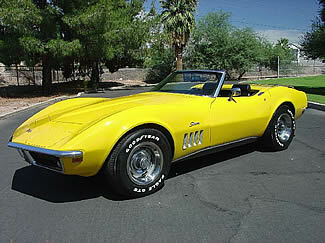 This ebeautiful Corvette has had a recent cosmetic restoration and was just purchased in Northern California. It has a desired factory 4-speed transmission as well as factory installed air conditioning, power windows, tilt telescopic wheel, and more. From Bob Peterson in CA. THIS ICORVETTE WAS AN ORIGINAL MONACO ORANGE CAR THAT HAS BEEN REPAINTED MILLINIUM YELLOW AND HAS A SOLID BLACK INTERIOR. THIS IS A 350 WITH 300 HORSEPOWER VETTE THAT HAS FACTORY AIR CONDITIONING, 4 SPEED TRANSMISSION AND TWO TOPS.THE EXTERIOR IS IN EXCELLENT CONDITION WITH THE ONLY REAL BLEMISH BEING A SMALL SPOT OF CHIPPED PAINT ALONG THE EDGE OF THE HOOD ABOUT 1.3 INCLES LONG. THE FIBERGLASS IS VERY STRAIGHT AND ACCIDENT FREE AND THE CHROME HAS BEEN REDONE IN THE LAST FOUR YEARS. MECHANICALLY THIS CAR IS A CHAMP AND RUNS AND DRIVES INCREDIBLE. THE ENGINE HAS BEEN TOTALLY REBUILT A FEW YEARS BACK AND DRESSED UP WITH SOME AFTERMARKET PARTS, BUT I ALSO HAVE THE ORIGINAL CARB AND INTAKE MANIFOLD. THE UNDERCARRIAGE IS NICE. IT HAS BEEN GARAGED IT'S WHOLE LIFE. THE SOFT TOP IS LIKE NEW AND THE HARDTOP IS IN EXCELLENT CONDITION ALSO. From Ronny DuChamp in MA. 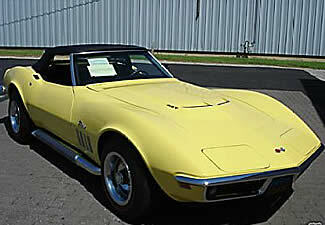 This Corvette originally came equipped from the factory as a 350/350hp car. It is also equipped with a four-speed transmission, power brakes, and power steering. The factory color is Fathom Green with a Saddle Vinyl interior. The body is in good condition with great body lines. The doors both have nice clean fits. 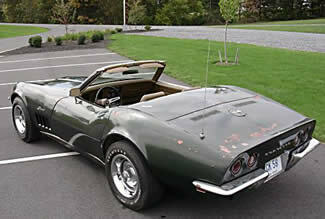 It's not the best 1969 Corvette picture, but I plan on restoring it some day. From Dave Harris in PA.
4-Speed, Numbers match. Daytona Yellow with Black interior and black soft top. Spectacular body-off restoration in show condition. Documented factory side exhaust car. From Greg Walters in CO.